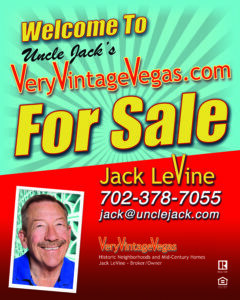 Uncle Jack's Very Vintage Vegas – Mid Century Modern Homes, Historic Las Vegas Neighborhoods, Las Vegas History and Urban Living by Jack LeVine – IS IT TIME FOR YOU TO MOVE UP? OR DOWN? As our lives change over time, so can our housing needs. You may find that you have outgrown your current home, or maybe you are in a better place financially and you want a newer, more luxurious one. If the idea of more amenities, a better location, or more square footage entices you, you may be ready to “move up”. With today’s affordable home prices and low mortgage rates, there has never been a better time to do so. One of the advantages of being a move up buyer is that if you sell your current home to buy the new one, you can use a portion of the equity towards the purchase. This could be a huge benefit when it comes to the down payment. Instead of looking to your bank account for the down payment money, you can look to the net profit of your home. Depending on how long you have owned your current home, what size down payment you made when you bought it and appreciation over the years you very well maybe able to Move Up and keep your current payment similar to what you’re paying now. The last three years Las Vegas has seen some of the highest appreciation in the Nation. There are a lot of things driving housing prices in the valley right now. We still have 30,000+ people moving here each year. There are $20 Billion dollars worth of major projects being built on and around the Las Vegas Strip. Those projects are supplying tens of thousands of jobs with even more jobs coming available when they are finished. There is a shortage of available homes on the market. We have way more buyers than sellers so people have been willing to pay more for the house they want. Zip code 89104 has seen a 26.5% appreciation rate in the last two years. The third highest rate in the valley and the home to many of the great Vintage Homes. You may be sitting on a lot more equity than you think right now. There is a buyer out there wanting your house. Anyone that says they can tell you the value to your home without seeing it is lying to you. The prices are changing fast in the marketplace today. An experienced agent needs to see your home along with doing real research to give you the true selling value of your house. There are too many websites giving “GUESSTIMATES” right now that you can spend hours entertaining yourself with. We have seen these websites give a $100,000 value spread on a single home when we researched them. We wrote about those results recently. Online Homes Guesstimates. If you want to find out the real value of your home you can either call me at 702-378-7055 or fill out the form HERE and I’ll be happy to give you that information FREE with no obligation. 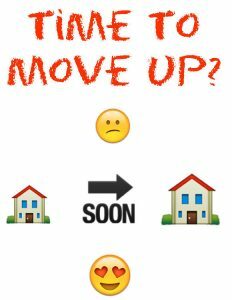 Now is the time to sell your house….. Recently released data from the National Association of Realtors suggests that now is a great time to sell your home. The concept of supply and demand reveals that the best price for an item is realized when the supply of that item is low and the demand for that item is high. Let’s see how this applies to the current residential real estate market. It is no secret that the supply of homes for sale has been far below the number needed to sustain a normal market. It’s been that way for well over a year. A normal market requires six months of housing inventory to meet the demand. The latest report from NAR revealed that there is currently only a 3.6-month supply of houses on the market nationwide. In the Vintage Vegas area there is currently less than a four week supply of houses currently listed. If you are one of the many homeowners who is debating listing your house for sale this year, the time is now! I can guide you through the process and discuss the specifics of your market!